Peda is a kind of sondesh which is made by ricotta cheese (chhana) and sugar. To give more flavour I used gur (akher gur). If you want, you can use only sugar. 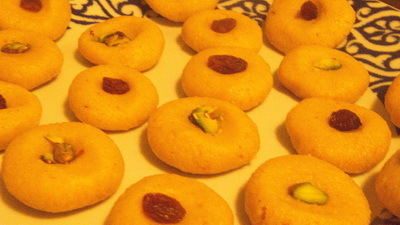 Hope you like this simple easy Gurer peda recipe. 1. Make chhana from 1 litre milk to follow my chhana recipe. Strain it. 2. Heat the pan with ghee and when ghee will melt, add chhana, milk, milk powder and cardamom powder. 3. Stir it continuously and after 8 minutes add sugar and gur. 4. Cook it till it starts leaving aside and becomes like a dough. Remove it from heat and put it into a bowl. 5. Let it cools down and now shape it. 6. Garnish with dry nuts and enjoy the flavour of Gurer peda. Tips: don’t make it crumbly. It will become like dough. Otherwise use more milk and cook again. Can I use ricotta cheese from store instead of traditional Chana?will it give same result? You can use ricotta cheese. but need to be unsalted one or at least salt reduced one. Thanks. Hi there, I have tried Gurer peda yesterday. It didn’t turn out as I expected. The peda is not smooth and too sweet. It’s also little bit soft. I think I can fix the sweetness and softness. But I don’t understand how to make it smooth? Should I smooth the chana before I start to put in the butter. I have used unsalted butter as I don’t have ghee. Your suggestion would be appreciated. Add more milk and cook it again. Do not forget to stir it continuously. Hope it will fix your problem. Thanks.